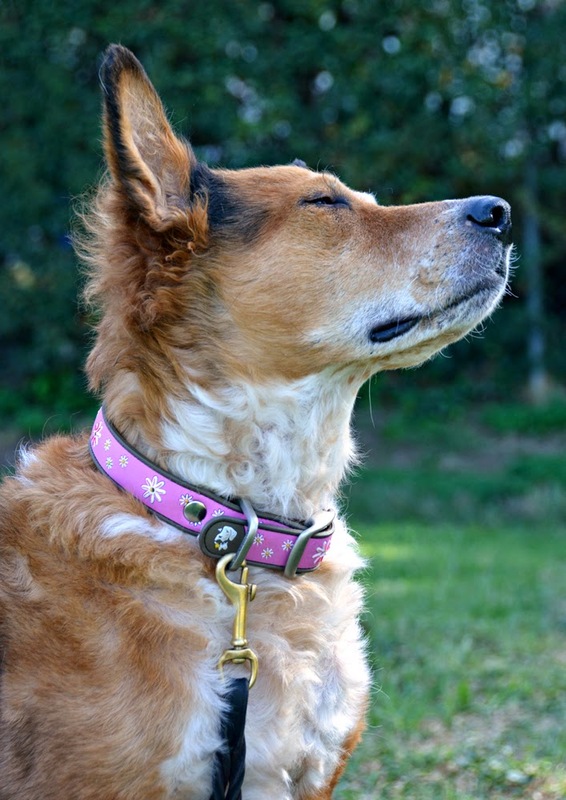 The Dublin Dog No Stink Waterproof Collar is a flat buckle collar that is waterproof and nonporous. It is made from a special polymer inspired by sport watches, and is intended to go everywhere and do everything while looking snazzy. Dublin Dog Original No Stink Collars are available in a variety of fun designs and colors, and come in three sizes for dogs with necks 11-12.5" around. Living on the coast, sand and salt water take their toll on our beach collars. While I've been using my Lupine gear for a few years, it's beginning to look a bit ratty and rusted. Despite my love of Lupine's lifetime guarantee, Brisbane and Ru's beach collars and leashes inevitably come home wet and sandy. Normally I either hose them off and hang them to dry, or just leave them on the porch until they are dry enough to shake most of the sand off. Either way, there is always some sort of de-sanding to be done with their gear. My dogs have a constantly changing array of collars to wear, preventing most of their wardrobes from looking too worn. Not everyone is quite as nutty about dog stuff though, and normal people tend to just put a collar on their dog and leave it there until they have a good reason to replace it. Dogs that get wet and stinky tend to have wet, stinky collars. Nylon webbing absorbs all sorts of nasty smells, and sometimes not even the dishwasher can de-stink it. Enter Dublin Dog, purveyors of collars made to breeze through the most epic outdoor adventures without bringing home the reek of wet dog. Hallelujah. I have personally thrown away collars that were defiled by the stench of skunk and the reek of dead stuff. Gross. Pros: Does not come home caked in sand or bearing the scent of low tide. Colors last for a long, long time. Non-porous, nonabsorbent rubbery material never needs to be dried. Cons: Like sport watch bands, these collars can hold moisture against the dog's skin, and cause rashes and yucky skin on sensitive dogs. Bottom Line: These are super popular for dock divers, and I love seeing them on dogs in the pool at work. This is Brisbane's new beach collar, it's almost as awesome as Ru's biothane harness.